DO I NEED PLANNING PERMISSION FOR GATE ORNAMENTS? Please note that ornamental gateposts or any other decorative features on fences, walls or gates are subject to the same rules as fences, walls and gates. This means that you will need to apply for planning permission if you intend to put up a fence, wall or gate and the total height including any ornaments and decorations exceeds 1 metre in height and is next to a road used by vehicles (or the footpath of such a road); or over 2 metres high elsewhere. if your rights to make changes to fences, walls and gates has been removed by an article 4 direction, you will also need full planning permission. We strongly advise you to contact the duty planner at your local council before commencing any changes. Do I need planning permission for gate ornaments, is a great question to ask before erecting any type of ornamental gateposts on your property. 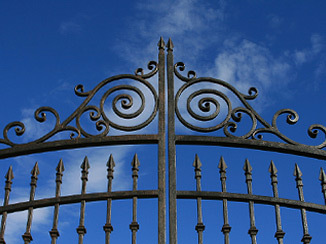 Gate ornaments are treated with the same respects as other types of fence, gates and wall enclosures. You will need to get gate, fence decorations planning permission if you are going to be erecting or adding to an existing fence or wall. You will also need to obtain planning permission if the ornament is going to extend over a metre, if it is located next to an accessible highway. If your residence is not near an accessible highway, then the ornament should not extend two metres in height. If the home that you plan on putting your gate ornament on is part of a listed building, then you will require permission from the planning authority, before any ornaments can be added to your gate or fence. If the fence or gate forms a boundary with a neighbors building that happens to be listed, then you will require planning permission as well. Even though planning permission is required for gate ornaments, the ornaments do not have to go through a building regulation approval process. Even though the building regulations are not applied to gate ornaments, the ornaments still have to be maintained and structurally sound.